Our internal medicine specialist is experienced in the diagnosis and treatment of disorders of the respiratory, gastrointestinal, cardiovascular, nervous, urinary, immune, ocular and endocrine systems. Many diagnostic modalities are utilized to assess these body systems in critically ill patients and patients with chronic, complicated, or uncommon diseases. Diagnostic tests include advanced collection and laboratory testing of tissue, fluid, and blood samples; biopsies of masses or internal organs; and diagnostic imaging including digital radiography, ultrasound, upper and lower respiratory tract endoscopy, lower urinary tract endoscopy, and gastroscopy. Ultrasonography (ultrasound) is frequently utilized to aid in the diagnosis of diseases affecting the heart, lungs, gastrointestinal tract, liver, kidneys, and spleen. Although these diagnostic procedures are generally performed in our hospital, some diagnostics can be performed in the field. For patients needing intensive care, our facility is equipped with oxygen ports to provide intranasal oxygen, and constant rate infusion pumps for the administration of IV fluids, intravenous nutrition, and/or blood products. Specially designed padded stalls equipped with a hydraulic lift allow for the care of neurologic patients. The isolation unit allows treatment of patients with infectious diseases while protecting the rest of the hospital population. Neonatal patients rest comfortably on specially designed, padded foal beds, and can be safely separated from their mares inside our roomy stalls. Our 24-hour professional staff and in-house laboratory allows extraordinarily attentive and comprehensive medical and nursing care of our patients. In the spring, the medicine department’s focus is on critically ill neonatal foals and their dams. We receive and treat foals with a wide variety of problems, and our goal is to achieve the best outcome for each patient while staying within the budget of the owner. By frequently assessing the patients’ progress, our internist can help owners make appropriate decisions. We are proud of the many successful outcomes that our team achieves. 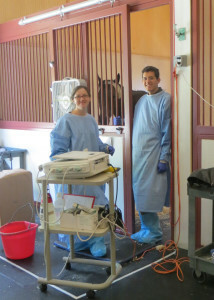 Referral from your primary veterinarian is recommended, as they are a vital part of your horse’s ongoing care.